With the Nipah virus assuming an alarming proportion in Kerala, veterinarians in Assam are leaving nothing to chances. Along with the rest of States across the nation, experts in Assam are on their toes and are constantly monitoring the possibilities and chances of the deadly virus invading the State. The nocturnal bats are considered as the most viable carriers of this deadly virus. Bats are common in Assam and also across the Northeast. Moreover, during this time of the year, when several fruits are in season, including mangoes, litchis and other seasonal fruits which are favourites among bats, the fear has all the more aggravated among the people of the State. Now what is this Nipah virus? The natural hosts of the virus are fruit bats of the Pteropodidae family, Pteropus genus. On this occasion, pigs were the intermediate hosts. NiV infection in humans has a range of clinical presentations, from asymptomatic infection to acute respiratory syndrome and fatal encephalitis. NiV is also capable of causing disease in pigs and other domestic animals. There is no vaccine for either humans or animals. The primary treatment for human cases is intensive supportive care. The scenario worsened after Kerala reported as many 10 deaths till the time of filing this report from this deadly virus. Even a nurse working with NiV infected patients had to embrace a tragic death through infection has shaken the entire nation. The nurse in question, Lini’s body was not handed over to the family to prevent the infection from spreading further. She was cremated under official supervision. 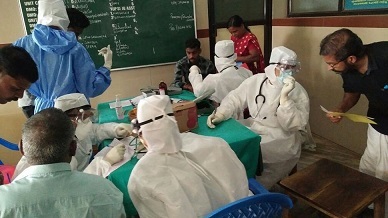 Dr Jahan Ahmed from the Department of Anatomy and Histology in the College of Veterinary Science of Assam Agricultural University (AAU), Khanapara also expressed apprehension of the deadly Nipah virus invading Assam. “There is definitely a fair chance as people frequently travel between Assam and Kerala. Moreover, Assam is also a home to a sizeable population of bats and during this season bats feed on mangoes, litchis and other seasonal fruits which aggravates the danger of human contamination,” Dr Ahmed viewed. However, the State Health Department seems to be oblivious of the gravity of the situation. At a time, when health departments of several states across the country have issued alerts against the deadly virus, the Assam Government is yet to issue any such advisory to its concerned officials and veterinarians.